When I was a little girl, one of my favorite things to do was spend time in the kitchen with my mom when she was baking a cake. I loved licking the bowl clean after she finished. Although she used a family recipe, which was a jazzed up version of boxed cake mix with canned frosting, it never dawned on me that these cakes weren’t truly made from scratch. They always came out moist and delicious. This is where my love of baking was established. As I grew older, I took over the responsibility of being the main cake baker in my family. For many years, I would manufacturer the cakes for every family members birthday. Eventually, baking cakes became something I detested and for many, many years, I just stopped. I’m not exactly sure when I regained my love of baking, but I can recall during my undergraduate years baking cakes for friends birthdays. Some of those cakes employed the family recipe of being semi-homemade and others were made from a recipe from scratch. Slowly my love of baking began to burn brightly once again. I don’t have as much time as I would like to devote to baking, but every chance I get, I try to jump back into it. That’s why when the opportunity to have a full weekend (both Saturday and Sunday) off arose, I found a recipe and put on my metaphorical baker cap and pre-heated my oven. I found this lovely recipe for a Coconut Cake on Food & Wine website. Since I didn’t like the way the recipe printed, I designed this template to house all of the recipes that i would want to keep in my “go-to” recipe folder. Instead of making a standard two-layer cake, I decided to use these really cute baking cups from The Container Store to make coconut cake cupcakes with a coconut cream cheese frosting. I followed the instructions provided by Food & Wine. I used a Cuisinart baking sheet with a baking rack to keep the cakes upright while baking. I baked them according to the instructions, but keeping a close eye on them for the last 5 minutes. I used a coconut cream cheese recipe that my mom gave me. 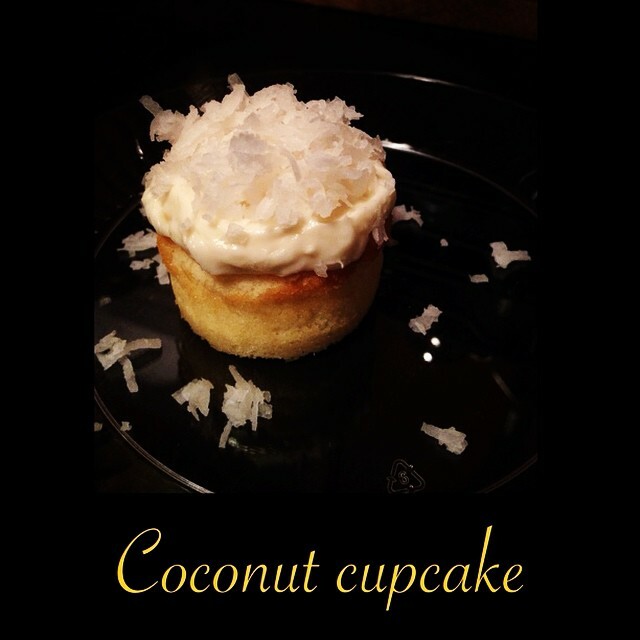 This simple recipe included: cream cheese, butter, coconut milk, confectioners sugar, and vanilla extract. Once I had the ingredients, I divided them amounts in half and made the frosting. The funny thing with the frosting was that I totally forgot to follow the recipe. After gathering all of the ingredients, I simply dumped them all into the bowl and whipped out my handy hand mixer and mixed away. The frosting was my favorite part of the cake; it was simply delicious. 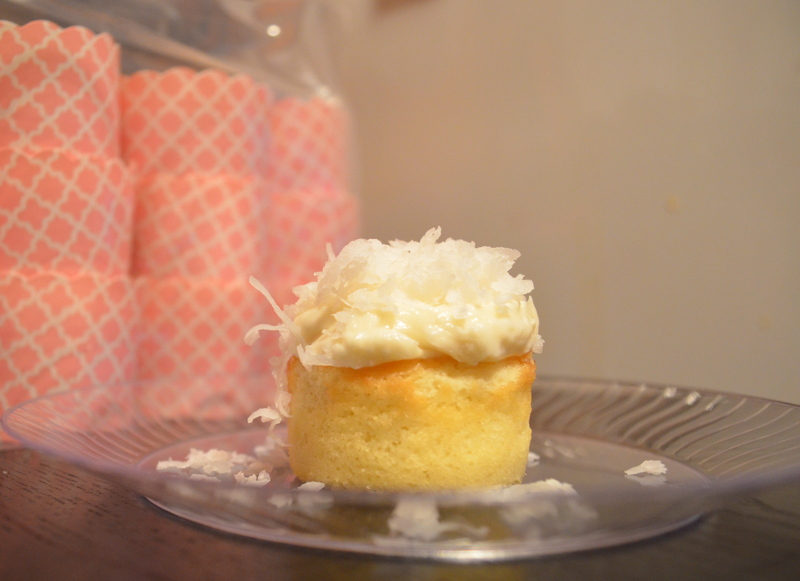 This recipe produced a light and fluffy sponge-like cup cake. The baking cups were the perfect vessel for baking these cupcakes. The cakes rose, but also left enough space for me to frost the cakes within the cups and to add coconut to the top without the coconut slowly flaking off. I would definitely make this cake again in both cupcake or layer form. It was simply delicious and my co-workers accolades made my day. If you enjoy coconut cake, I highly recommend using this recipe to make one of the most delicious coconut cakes you will ever eat.